Since early man first learned to form tribes, they have depended on dogs to help them do their work. Not much has changed in the world of sheep. Nomadic tribes used dogs as protection from predators for thousands of years, effectively protecting very large flocks in remote regions. We recently added a third livestock guardian to our team. 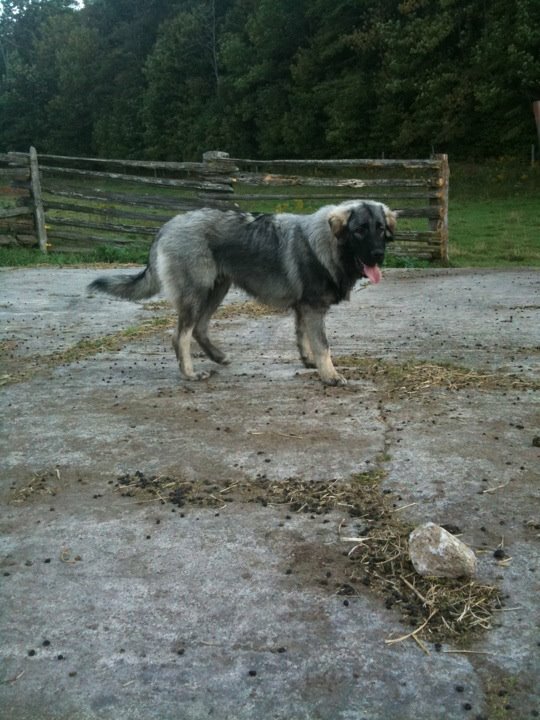 Murdzo is a purebred Sarplaninac, and at 6 months he is already 100lbs! We were not certain how he would fit into our pack, but the transition has been seamless. He has been readily accepted, and they are now a strong team. His first visit with the sheep was wonderful, he did all of the right things. Approached them slowly, allowed them to smell him, and sat looking disinterested to show submission. It's amazing that our ewe lambs will still run from us, but will run to the dogs! It is almost as though they instinctively know that the dogs are their guardian angels, there to protect them from things that go bump in the night. Murdzo was a cherished and much loved pet for the first 6 months of his life. His family was very sad to see him go but circumstances changed and they needed to find him a new home. The farm was perfect, and it means they can visit him any time they like. We are truly blessed, he has such a happy go lucky temperament, and is a wonderful addition to our farm. He has enjoyed his new found freedom, and spends his days with our other two dogs exploring the fields, chasing chipmunks in the forest, and watching over the sheep. Dogs with jobs, are very happy dogs indeed. So where is the Romance?